The aim of the workshops is to enable the doctoral students of the BioSC to expand their spectrum of methods and their cross-disciplinary networking expertise. A future bio based economy needs novel concepts for integrated biorefineries. Understanding the current capabilities, barriers, and opportunities for such an integrated biorefinery working to produce biochemicals, bioproducts, and biofuels is a prerequisite for young scientists in the whole field of bioeconomy. This workshop targets to provide knowledge on different strategies existing for the conversion of biomass and is especially for PhD Students, Post-Docs and early stage researchers. This will offer a unique chance to get closer insight on the topic of lignocellulose processing provided by experts from academia and industry. The workshop consists of two parts. Starting with lectures about the corresponding activities in the BioSC and is followed by an interactive workshop on Process Design for Biorefineries. This part will give you the opportunity to understand the process of designing a suitable processing chain to get from a substrate to a product by choosing from different downstream options. The first part is free for any interested attendees. 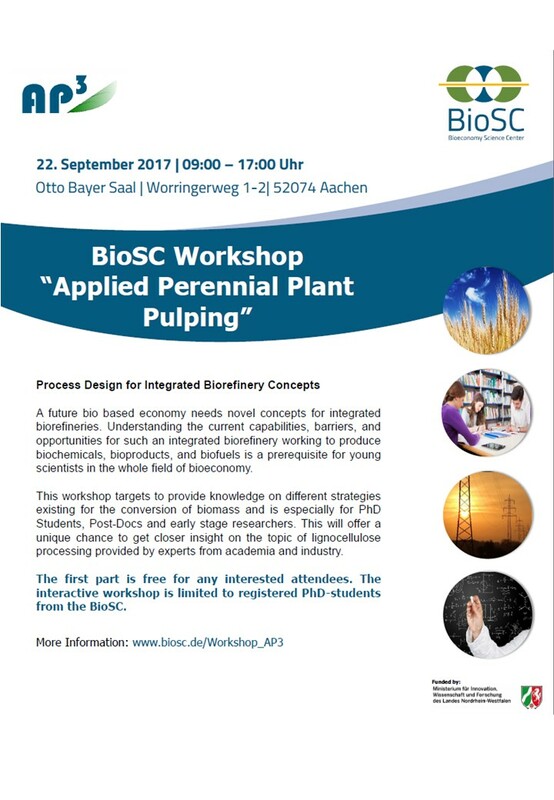 The interactive workshop is limited to registered PhD-students from the BioSC. Registration is open until 15th of September 2017.